This topic contains 22 replies, has 8 voices, and was last updated by DeLoris Musick 5 months, 2 weeks ago. Since our November theme is VINTAGE, do you have a photo of some vintage objects you have? It could be an old doll, an old dress, an old plate, an old broche, etc. You can use the free laces from the blog post to embellish your project. Tell us the story of that object. We are always curious! 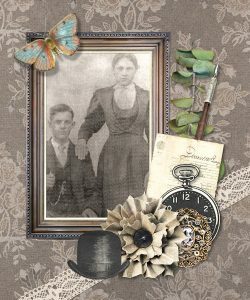 I did a page about my mom, it is vintage and I used the laces Cassel provided. Thanks Cassel. My mom loved to sew so I found a dress form. I used a lot of color layers. The main colors of the kit I used were brown and blue. So I used color layers to change the color of the blue elements to a burgundy color. 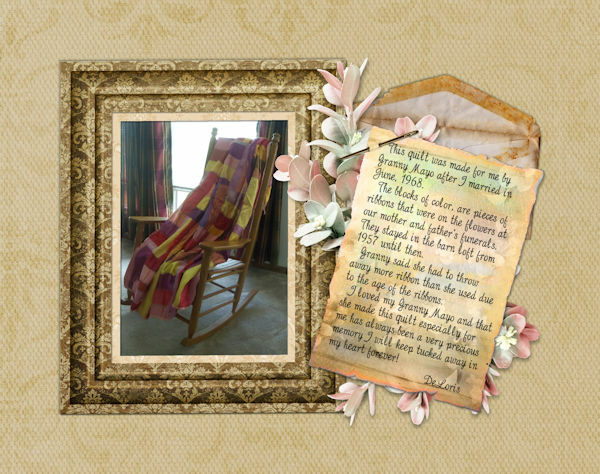 hello Royanne, your page is absolutely Beautiful… the vintage effect is wonderful… well done! 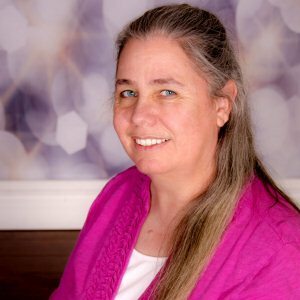 Royanne, your page is beautiful! I love the colors! I have to tell this story to explain my picture (You might not be able to read the words on the page since it is so small here. My mother died when I was 7 and my father died when I was 12. My mother’s mother saved the ribbons from their flowers that were at their funerals. She kept them in a bag in the barn loft. 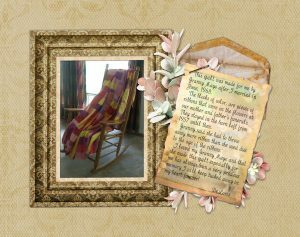 When I got married in 1968, she made me this quilt from their ribbons. I never use it of course because it is fragile since it is made of ribbons. But, I layed it across my rocker to this picture. This is a page in my Siblings Photo Book. This is a picture of my paternal great grandparents. I used Carole’s lace and a vintage kit by Kimeric Kreations. Royanne, you did a great job honoring your mom. It’s beautiful. DeLoris, you made me cry. Royanne and DeLoris, not only the layouts but also the stories are beautiful! Great work! Thank you Cristina! 🙂 Michele, life throws us lots of curves. 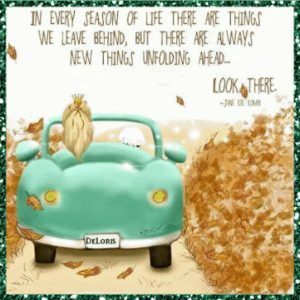 For all I’ve gone through, I am truly blessed and grateful. I have 2 beautiful and kind daughters and a wonderful grandson. Good times, bad times, it all leads you to where you are today. All paths lead you to “YOU”. We should always count our blessings and be thankful. 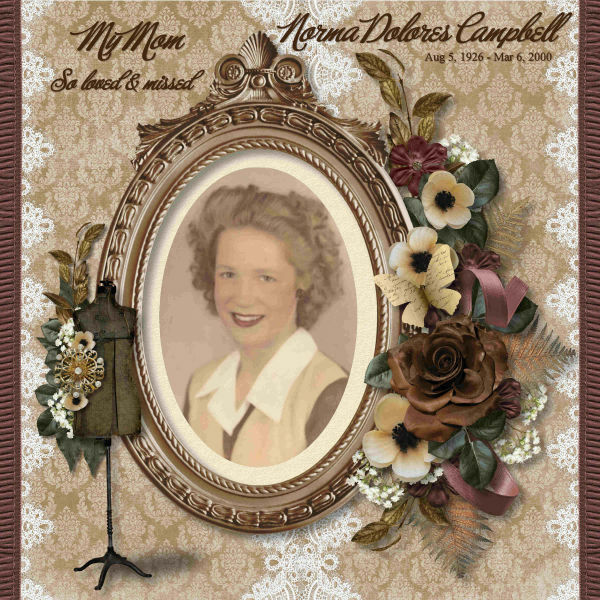 Hello DeLoris, your pages are Beautiful ! and i agree with your comments above.. through good and bad times we still have a lot to be thankful for. 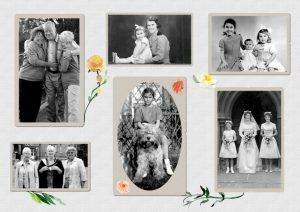 Some beautiful work here, great to see the old photos, I don’t have many as I left England when I was 22 and back then didn’t really worry about family photos. My brother-in-law has done our family tree and sent me a few copies which is very nice. 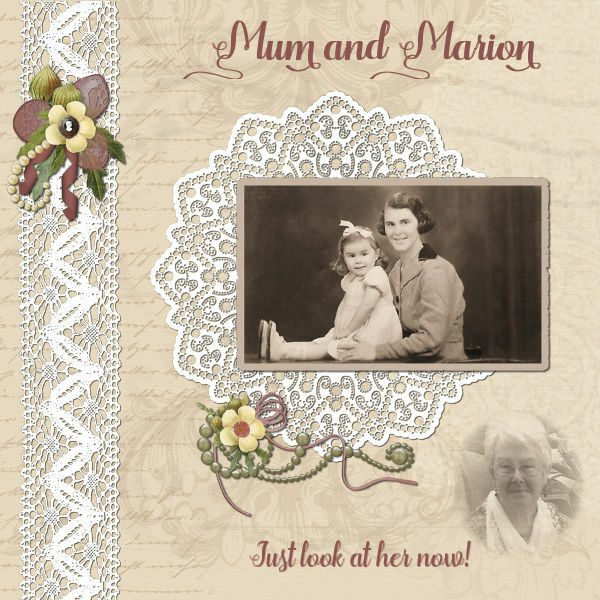 For this page I used one of the photos Brian sent me, showing Mum and my oldest sister Marion (not Brian’s wife). I chose this for two reasons: Marion has just finished treatment for cancer and is hopefully on the road to recovery; and she has birthday on Monday when she will be 80. The “Now” photo was taken 2 years ago when she and her husband had a “High Tea” to celebrate Keith’s 80th Birthday. I used Cassel’s Laser Cut Doily and the Vintage Lace, the other elements are from a set I have called Vintage Spring (I don’t know who by). The font is Sophia Art Design. Beautiful job, Marlene. Unfortunately, I don’t have many family pictures at all. My sister got them all when my mom was in the early stages of Alzheimer’s. Neither brother nor I accepted anything from her after she got sick, but my sister is a unique one, to say the least. Marlene, this is beautiful and it is good to hear your sister is doing better! Michele, that is sad. After my youngest brother (older than me) passed away from cancer, my oldest brother, my sister and I combined the few pictures we had and I got to make my siblings book. It took me a year to make and my brother paid for the books. I still need to buy one for me so I have 2, because I have 2 daughters and I want them each to have one. These old vintage pages are soooo special to us and out children. I think I’ve share this before. It is the video I made of my siblings book. This reply was modified 5 months, 2 weeks ago by DeLoris Musick. Marlene, a beautiful memory page and i hope all goes well for your sister. The central photo is of my great grandparents, born approximately 1854-56. The small black and white of 2 walking is of my grandparents, she is the daughter of the central people. The young woman is my mother, no idea how old she was at the time. The wedding is my mother and father in 1937, hardly vintage but a follow through of the part of the family. 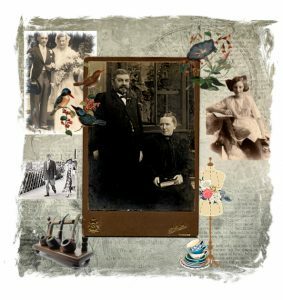 Our son is working on a video presentation of old family for my husband and I, voices over and so on. I spent many hours pouring over photos, scanning and post processing until I was nearly cross-eyed! 🙂 It will be lovely to see when he is finished though. Thanks for looking. Anne, I love your page. I really like the central photo and the others on each side. Great Job! 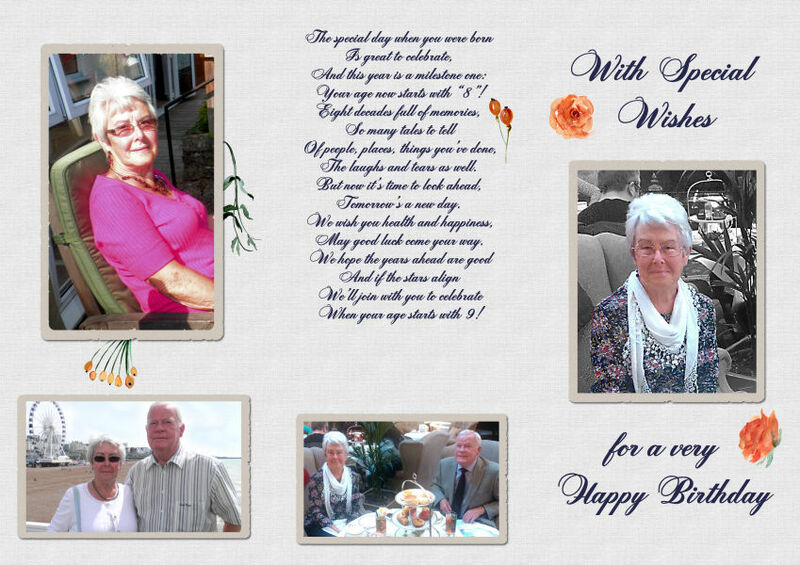 I thought I would show you the card I made for Marion’s Birthday, it is A4 trifold. I decided to make the inside all black & white as some of the photos weren’t the best, but then went with colour on the front. The flowers are from Koko Loko Watercolor Floral, the poem is my own. Marlene, these pages are lovely! I love the poem. 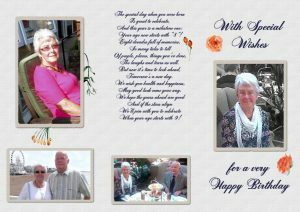 Thanks DeLoris, I have written quite a few poems for different age birthday cards, some generic and quite a few specially for the person the card was for. I also used to go on 4WD Tag-A-Long tours and the tour operators (now really good friends) had a Log written every day by someone in the group and they asked for a poem, ditty, limerick etc. Not everyone was able to do this but there were many that were really good. Another bit of fun I had was retirement songs for friends – I did one around “Starry Starry Night” for an Art Teacher whose favourite artist was Van Gogh, and “When She Was A Girl” (Gilbert & Sullivan) for my Admin Officer at the school with whom I had worked for 19 years. I would get the Art Department (Music & Drama particularly) to sing the songs with me at the leaving party. When I left, the Drama Teacher wrote a song based on music from some of the Musicals I had produced while at the school. I still have the original poem. Marlene, Such wonderful memories you have. I use to write poetry, but it was for me and I never shared them. 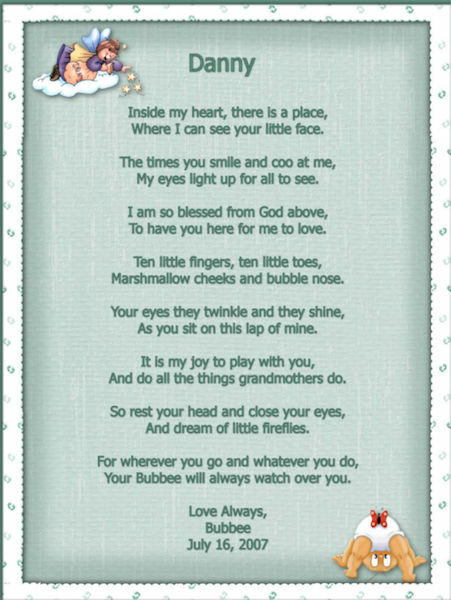 I did write one for my grandson Danny when he was a few months old. I’ll attach it. 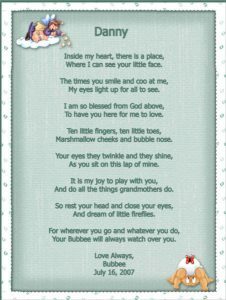 That video is an amazing keepsake, DeLoris, and your poem for Danny is very sweet. Marlene, your card is so special. I’m sure your sister loved it and I hope she recovers soon. 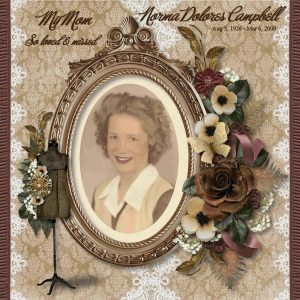 Marlene, DeLoris and Anne, lovely layouts/videos and heartfelt stories.